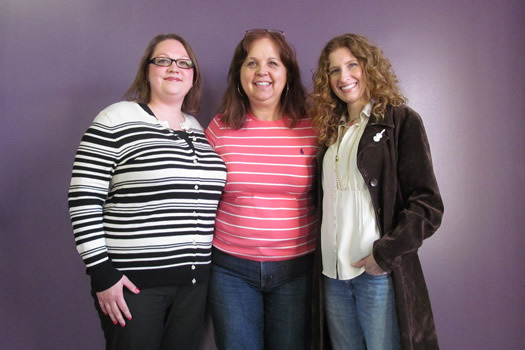 From left to right: Shannon Campagna, The Peanut Principle; Sue Kerber, RAD Soap Co.; Colleen Zorbas, Zorbas Natural Foods. What's the hardest part about starting a new farmers' market? At least, that's what Sue Kerber, Colleen Zorbas and Shannon Campagna think. Together, they're the founders of the new Spa City Farmer's Market. And after three months of planning, the business owners admit 2 am texting has gotten old for them... and their husbands. But that planning has the new Sunday market ready to launch later this month. So why start another farmers' market? Saratoga Springs already has a well-established farmers' market -- the Saratoga Farmers' Market -- on Wednesdays and Saturdays. But the Spa City trio says they want to provide an alternate day for people who are busy on the weekends. "You know, some people work on Saturdays, some have religious obligations or some have children on sports teams," said Campagna, owner of The Peanut Principle in Latham. "We just think people need another day." She also pointed out that other cities, like Rochester, also have a markets three days a week. So starting May 19, the year-round, for-profit Spa City Farmer's Market will be open from 10 am-3 pm on the lawn in front of the National Museum of Dance and Lincoln Baths. In the winter, the market will head inside the museum. Are they trying to compete with the already-existing market? The trio says no. Zorbas -- who owns Zorbas Natural Foods -- is a vendor at the Wednesday and Saturday market and said most of the vendors there are excited for the new market. "Most of the response we get is 'What a good idea!' But I think if people feel negative about it, they won't once they see what we're trying to do," she said. That goal is to create the sort of market they'd like to attend. "We kind of wanted it to be like an event and a day out for the whole family. We'll have food, music, a kids tent, face painting, wineries and breweries will be there. So that way people can come, get their food and groceries, sit on the lawn, have a picnic, listen to music and visit the museum," said Zorbas. The list of vendors ranges from local farms to a Boston fishmonger to Nighthawk's Kitchen - and even some from the Wednesday and Saturday market. The trio says they first thought of Saratoga around the opening of the new Healthy Living Market in Wilton. The supermarket had contacted local businesses looking to sell their products, and it now carries items from Zorbas Natural Foods, The Peanut Principle, and RAD Soap. That helped generate Saratoga-area interest for the ladies' products. Add in the fact that Saratoga summers attract people from all over the world, and the city sounded like the right spot. Now they're working with both the museum and Spa State Park to make the most of the market. Their hope is that SPAC concerts will bring people to the park, where they'll happen upon the market, and also visit the museum. "We have a buzz around it right now and everybody seems really excited about it, but we don't know yet how it will turn out," said Sue Kerber, the owner of the Cohoes-based RAD Soap. "But all of us have been doing this for so long -- Shannon has been doing this for eight years. So people trust us. They say 'If you're doing it, we're doing it.'" Earlier on AOA: RAD Soap Co. I know Shannon Campagna from standing next to her for hours selling our products in farmer's markets. She is a strong, smart business woman. Some farmer's mrkets are a little "holier than thou" but this one will be a delight for the customers and the vendors. Some of the best products around are already listed to sell there. Just FYI, the article doesn't actually mention what day the market is on - just that it begins May 19th. My superpowers tell me this is Sunday but you might want to add it. Editors: Yep, that should have been explicit. Fixed. Thanks. What about people who work during the day? Wouldn't something after work be more helpful? Daytime M-F isn't good and that's why the weekends are so busy for people, since they are at work the rest of the week! Boston fishmonger?!? Nah - we're from right here - Ballston Spa and Niskayuna, originally. We (fin - your fishmonger) bring in Grade A, fresh, sustainable seafood from Fish Pier in Boston. Our brand new shop sits in Guilderland.